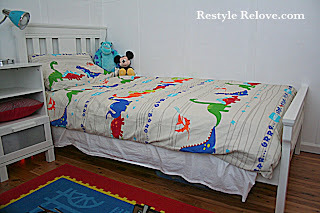 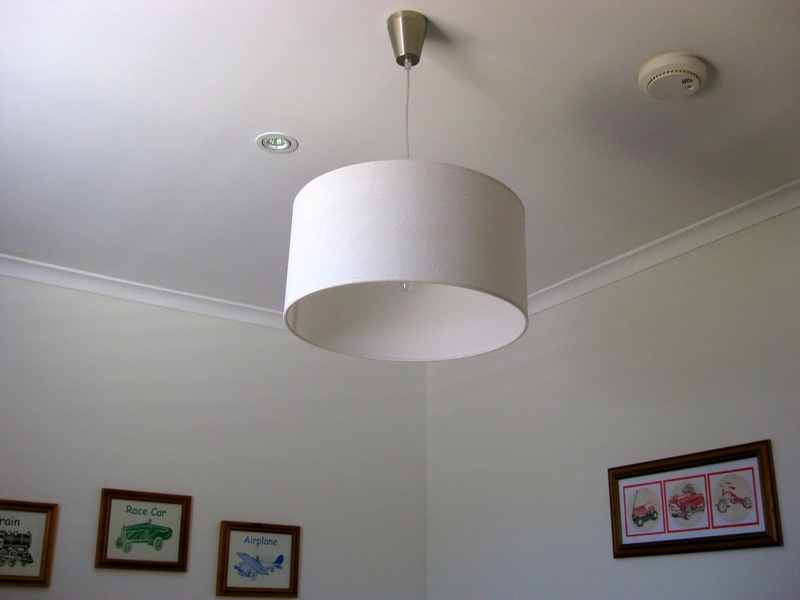 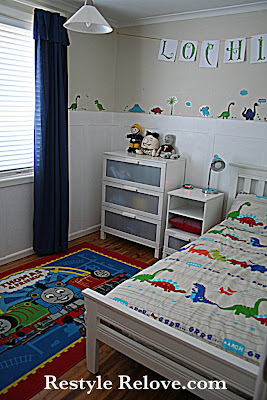 Over the holidays my 3 year old son's bedroom also got a mini makeover which I'm thrilled to share with you. So let's take a quick tour. 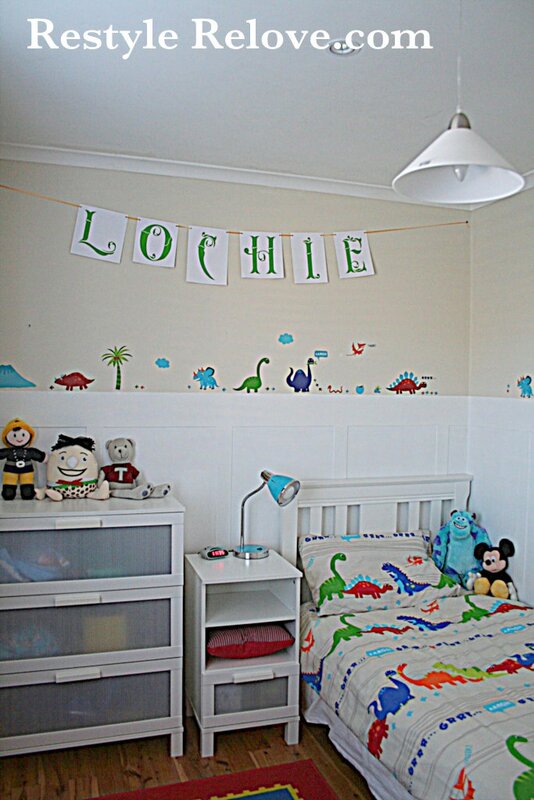 As you walk into Lochie's room you see his dress up corner. 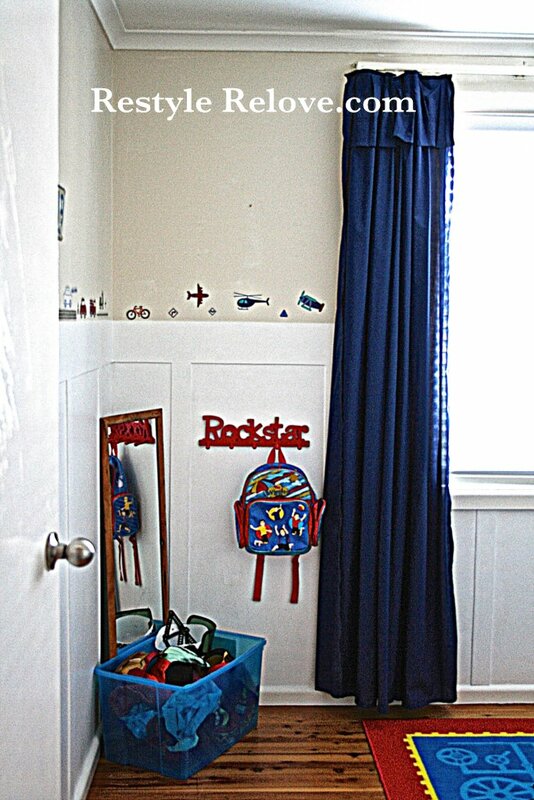 I added navy sheets costing $14 over the top of his tan coloured block out curtains to make it more colourful. 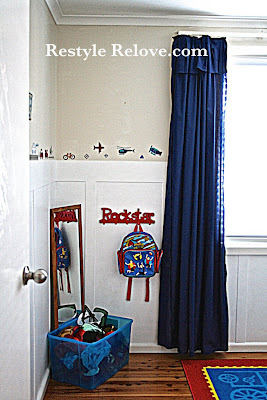 My son wanted blue walls so it was a compromise. 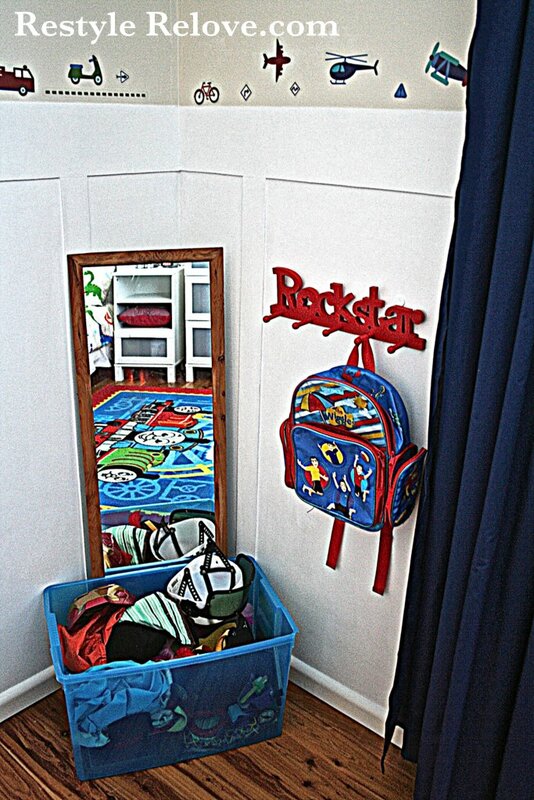 And the Rockstar hook hanger is a new addition for $5. The mirror I had spare and same with the blue plastic storage box. 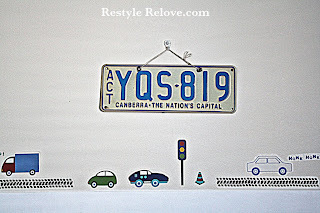 Above the dress ups we added some cute car wall stickers for $5. 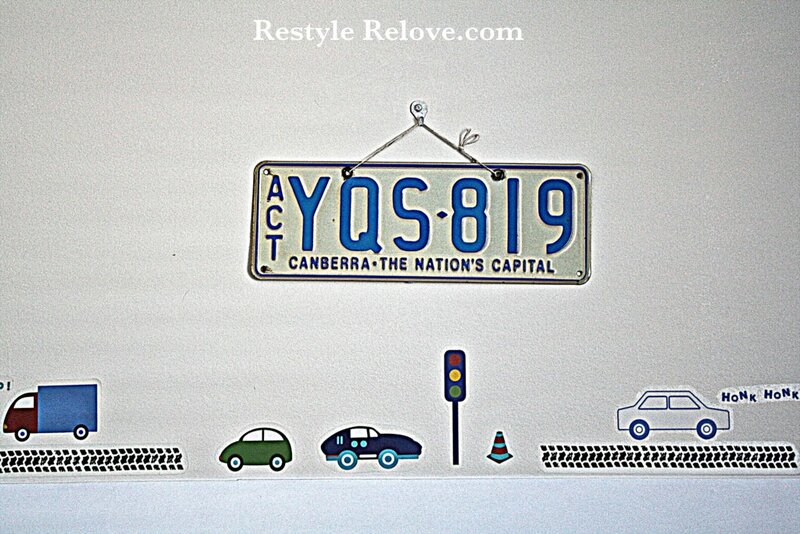 The old number plate is from one of my husbands first cars. His main light shade I swapped for a smaller industrial style one for $5. 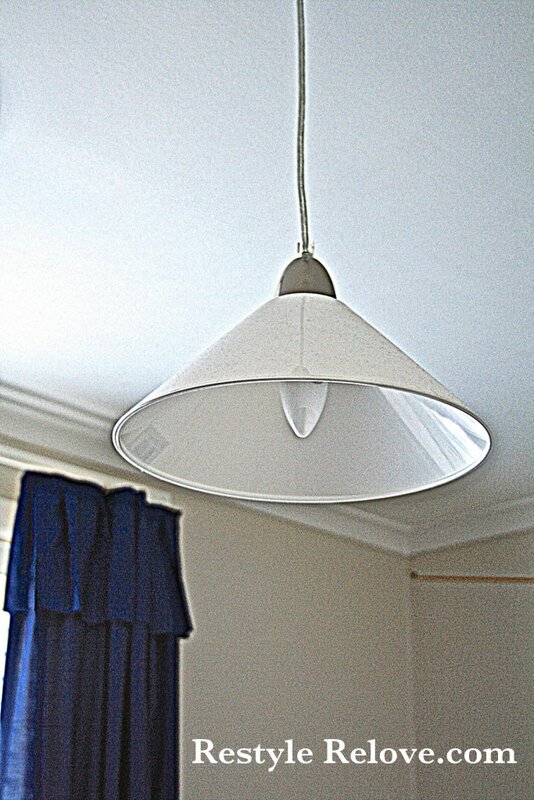 It lets so much more light into the room and looks a lot better than the larger one I had previously hung. 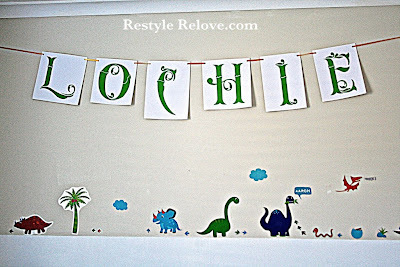 Above his bed we hung his name sign which I had created for his birthday party last year. 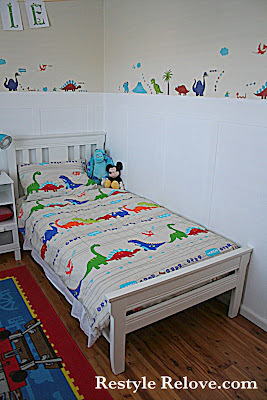 The DIY board and batten walls are also a recent addition. And I kept the Hog Bristle up the top. 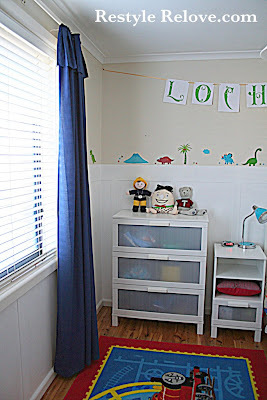 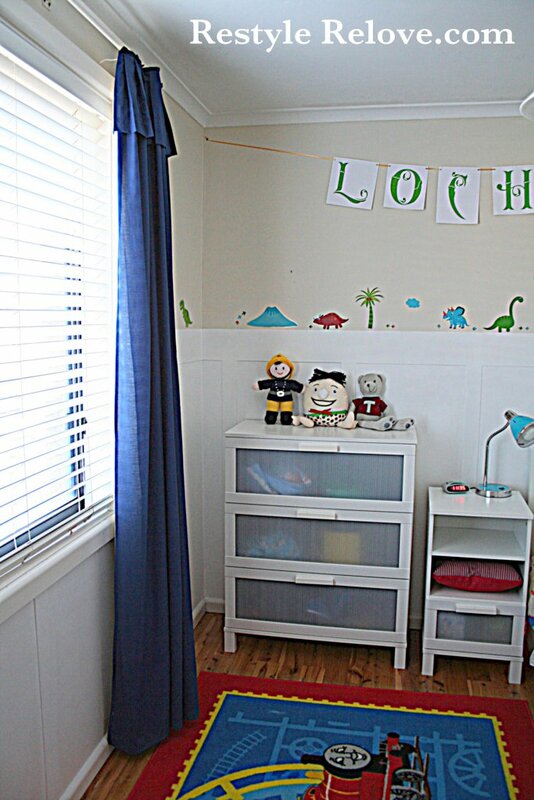 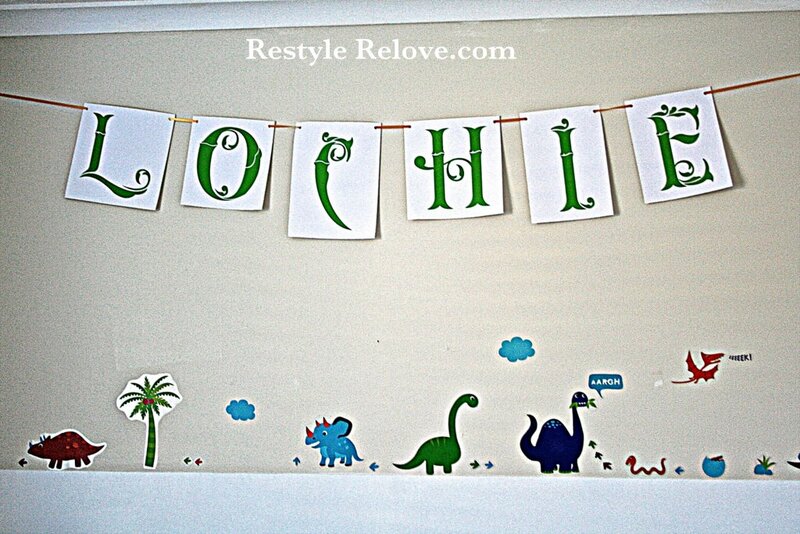 We did however add some cute dinosaur wall stickers for $10. 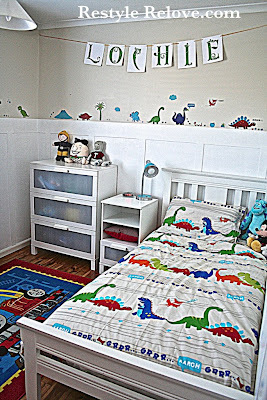 I recently moved his Ikea drawers back to his room and kept his matching side table. He currently has a Thomas rug, but I'm searching for a more neutral one. 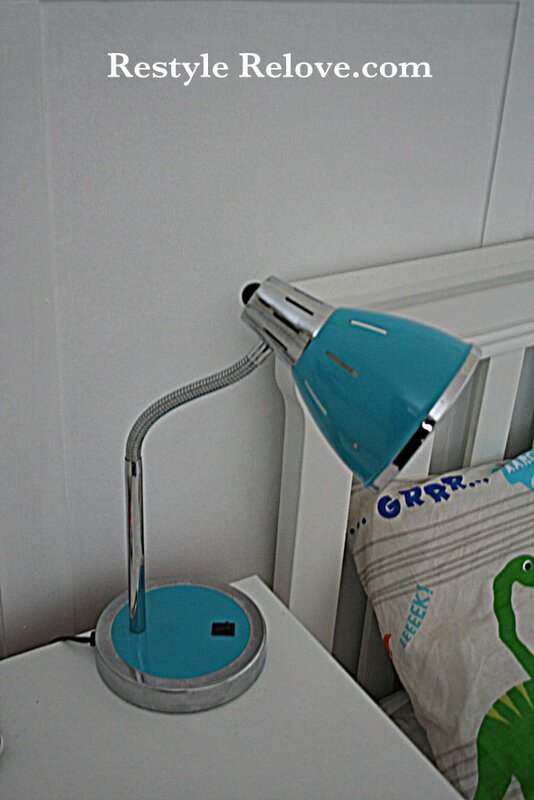 I also bought him a new bedside lamp a short while back which I think is really cool and industrial style and cost approx $25. 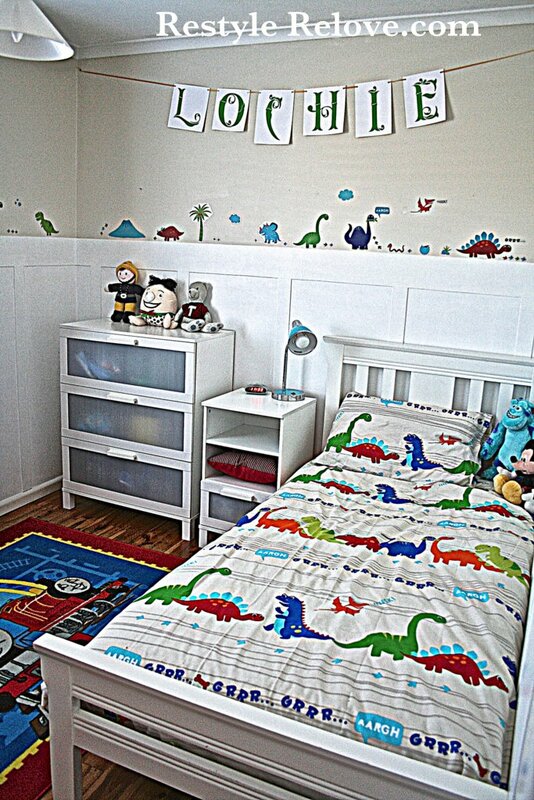 We purchased the Dinosaur quilt cover for $16. 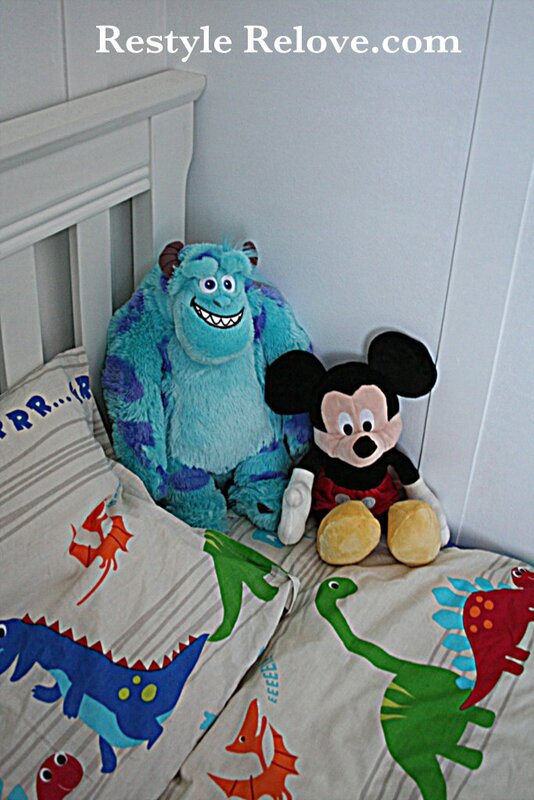 Mickey and Sully love sleeping with Lochie. 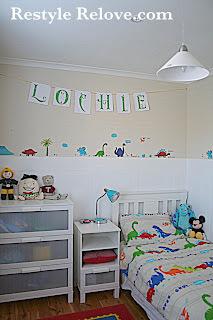 I love Lochie's white wooden bed as it is low enough for him to climb into. 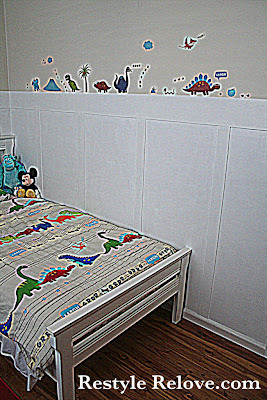 The before was just a bit too grown up. 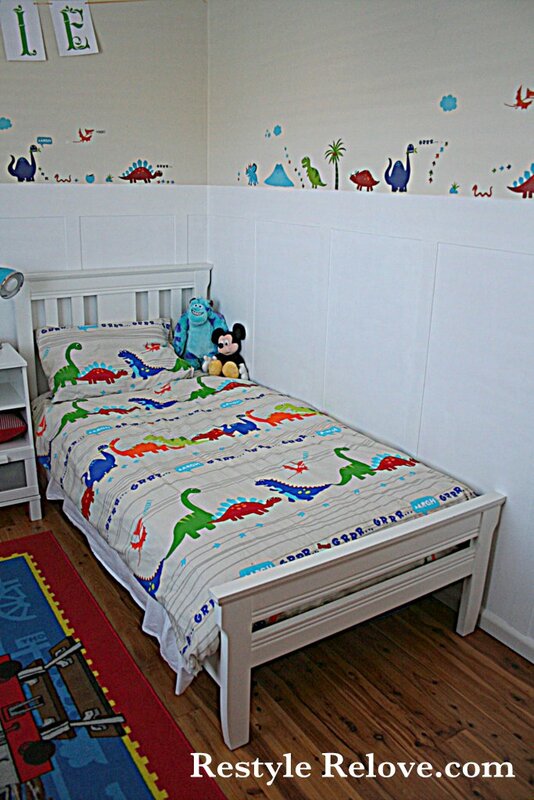 And now his room is dino terrific! 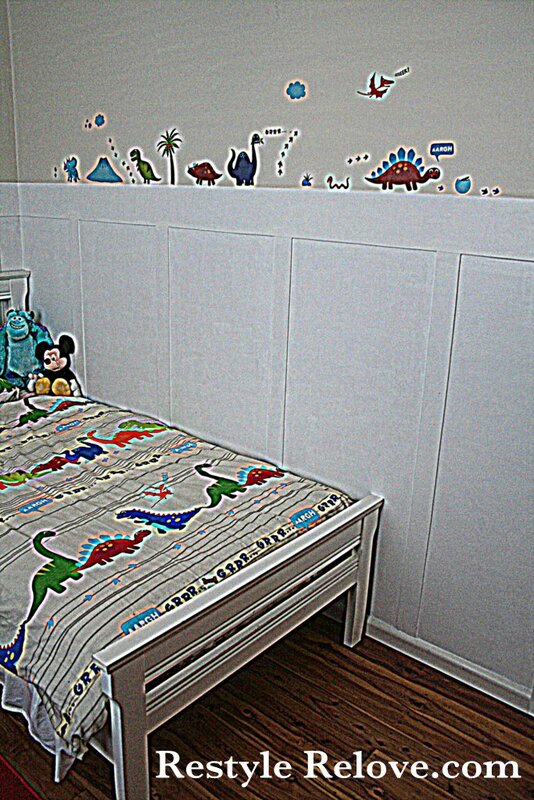 :) And for approx $100 all up including the new walls. 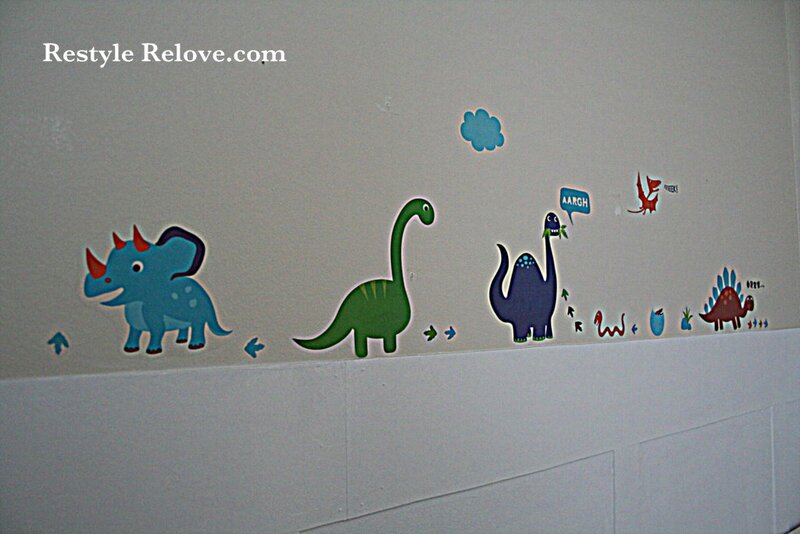 Thats pretty cool, Dinos are awesome.